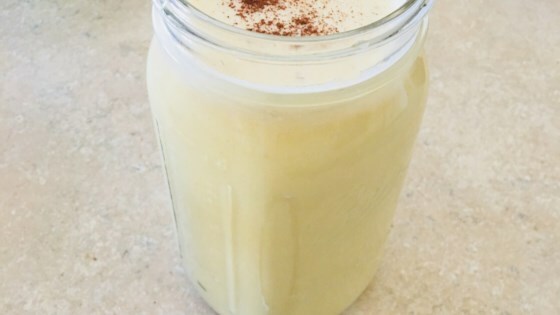 "This rich and creamy drink was especially designed for cold Christmas nights. This recipe contains raw eggs. We recommend that pregnant women, young children, the elderly and the infirm do not consume raw eggs." In a large mixing bowl, beat egg yolks until they are thickened and light. Gradually stir in condensed milk, sugar, vanilla and milk. Beat the egg whites until stiff, then add them to the milk mixture. Stir rum into the mixture (to taste). Garnish with nutmeg. quick, easy, and tasty! i added about 2 additional tablespoons of sugar and a bit more vanilla, and i used 1% milk to keep it light and it worked very well. everyone loved it! This eggnog is tasty but it lacks the thickness usually associated with the beverage.